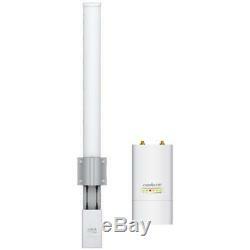 UBIQUITI AMO-2G13 2,4Ghz 13dbi 2x2 MIMO Omni Outdoor Antenna + Rocket M2 KIT. AMO-2G13 2,4Ghz 13dbi Omni Outdoor Antenna + ROCKET M2. Next-Generation 2x2 Dual Polarity MIMO Omni Antenna Design. AirMax Omni is a Carrier Class omnidirectional antenna that was designed to seamlessly integrate with Rocket M radios. AirMax Technology provides performance improvements in latency, throughput, & scalability compared to other outdoor systems in its class. AirOS is an intuitive, versatile, and highly developed Ubiquiti firmware technology that is included on Rocket M units. All versions of AirMax Omni feature 2x2 MIMO to help it achieve Carrier Class speed and performance. Rocket M combines the brains in one robust unit; pair Rocket M with AirMax Omni to create powerful 360? This seamless integration gives network architects unparalleled flexibility and convenience. Available in 2.4GHz & 5GHz. 10dBi base model, and 13dBi High Gain model are available in both 2.4GHz and 5GHz. AirMax Omni antennas all come with a universal Rocket M mount for easy installation. Rugged, weatherproof RF cables are included with AirMax Omni antennas. No cash, cheque or National Postal Order payments. All our sales in European Union include VAT. We speak English, German, Latvian and Russian. Send your question anytime and we will reply to you as soon as possible. Most deliveries arrive within 5-6 days from placing your order, but can take up to 30 days to arrive. This option is not available for orders over 2kg in weight. Contact our dispatch center for more details. (If paying by eCheque, your order will be sent once funds have cleared). VAT is included in final price. Check the listing for the type of postal services offered. If you require express timed deliveries please contact our dispatch office during working hours. Pick-up service is not available for any of our items. Ensure your address is accurate before placing your order with us as we cannot amend these details once the you have placed your order. All power supply units (PSU) or POE are universal 50/60Hz and 110/220V with European plug or cord. All PSU or POE can be used in any country with suitable adapter or suitable cable. EU->US adapter is included for parcels to US and Canada. When returning, we are not liable for loss or damage of your item in the post. Please insure and track the parcel you are sending. (We record all serial numbers). Be certain to read the above listing carefully. Please leave honest and fair feedback. Registered since 2007 in Latvia (European Union). Our products are always competitively priced. We back this up with a price-match promise. Want to be the first know about our products on sale? The item "Ubiquiti AMO-2G13 2,4Ghz 13dbi 2x2 Omni Outdoor Antenna + Rocket M2 KIT" is in sale since Thursday, October 05, 2017. This item is in the category "Computers/Tablets & Networking\Enterprise Networking, Servers\Directional Antennas". The seller is "ubntshop" and is located in Liepaja. This item can be shipped worldwide.